CLASH OF THE TITANS is the ultimate struggle for power that pits men against kings and kings against gods. But the war between the gods themselves could destroy the world. 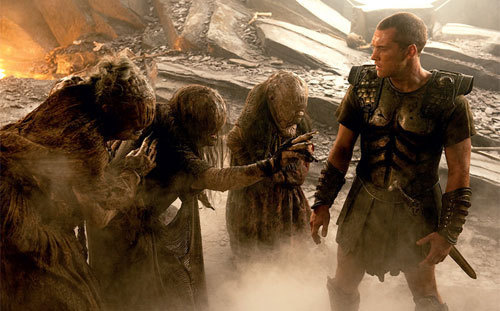 Born of a god but raised as a man, Perseus (Sam Worthington) is helpless to save his family from Hades (Ralph Fiennes) vengeful god of the underworld. With nothing left to lose, Perseus volunteers to lead a dangerous mission to defeat Hades before he can seize power from Zeus (Liam Neeson) and unleash hell on earth. Leading a daring band of warriors, Perseus sets off on a perilous journey deep into forbidden worlds. Whether you like the remake of the 1979 movie CLASH OF TITANS will probably have a lot to do with whether you enjoyed the first film or not. The original movie is fondly remembered as the triumphant swan song of stop motion animator Ray Harryhausen. It starred a fine group of British thespians and for a generation of children it was their introduction to Greek myth.But try watching it now. It has not aged well in the special effects department. The new film is predictably a CG fest, but it is also better plotted, better acted and better paced than its predecessor. The graphics, far from being an expensive snore, are an integral part of the action. The beastly characters like Medusa and The Kraken are well imagined and realised. The enmities and alliances of the gods particularly between brothers Hades, Poseidon and Zeus are much clearer, too, giving the new film a narrative shape the audience can follow and engage with. A lot of criticism has been aimed at Western Australia’s own Sam Worthington. The ‘substance’ of the complaint seems to be: ‘We don’t find Sam’s Rockingham Bogan portrayal of the heroic Perseus very convincing”. To which I say, ‘meh’. Pretty sure that had Zeus and Hades existed they wouldn’t have sounded as though they were trained by the Royal Shakespeare Company and would probably have expressed themselves in ancient Greek. As with his lead role in AVATAR, I think Worthington proves himself, yet again to be a capable Hollywood action hero. Neeson, Fiennes and Mikkelsen are also very good. The usual chilliness of Fiennes is perfect for the put upon and ambitious Hades. Sadly, the role of Andromeda isn’t very rewarding for Alexa Davalos and the main female role is taken by Gemma Arterton as the demi-god Io. The curly-lipped Arterton is about to be seen in a similarly mythic role in the new PRINCE OF PERSIA movie. The ending of CLASH OF THE TITANS is exciting and compelling rather than the ‘big boss battle’ a lot of CG heavy films end up being. The ending is cinematic and choreographed and feels like the conclusion to a strong story. For once, the big ending means something.This film was shot standard and then upsized to 3D. The result has been universally panned. It isn’t a patch on a 3D film like AVATAR., however, If you don’t particularly care about 3D – as I don’t – then this tinkering won’t matter. Clocking in at 106 minutes, this film is a swift journey through the world of classic Greek myth. Some of the details of the world of man, demi-god and god are hashed up to make the story play for modern audiences, but the cruelty, capriciousness and compassion that always make the gods on Olympus understandable from a human point of view, are still an important part of this tale.